The use of gorgeous and wonderfully crafted specialty themes for your blog can entice visitors to visit your page and attract them to read your content. The use of these themes enables bloggers to generate more traffic to their page naturally to create more followers and to attract attention. This is used in both personal and business aims to attract more readers and promote an idea or a product. Most importantly, these Tumblr Themes show the distinct personality and traits of the blogger. Here are some dark Tumblr themes you can use for your blog to suit your style. 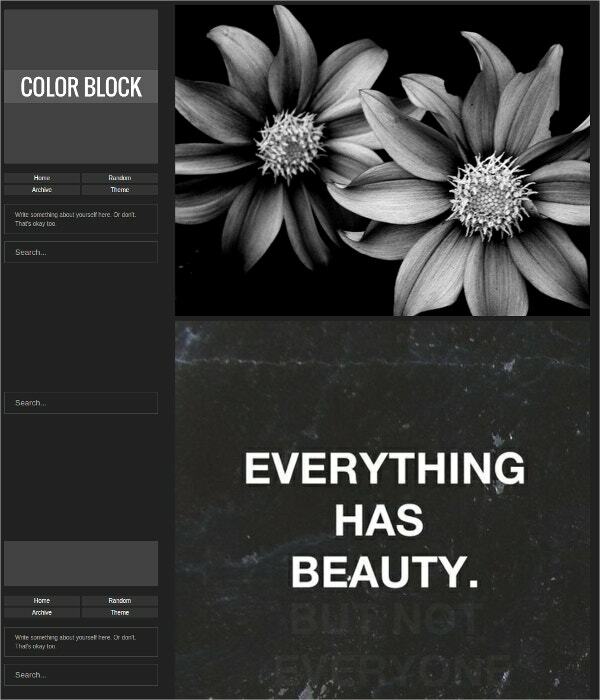 This dark block theme is best used for pages which appeal to the simplicity of the color. The dark background emphasizes pictures and posts while accentuating the personality of the writer and blog owner. It has preset options that let users add their specific content to the template without doing much change to the configuration. This dark theme features a simplistic approach to blog various blog elements and capitalizes on this unique setting. The theme is easy on the eyes and it will let blog visitors and readers feel comfortable and relaxed while skimming through the posts. This invites them to read more of your content without much effort. 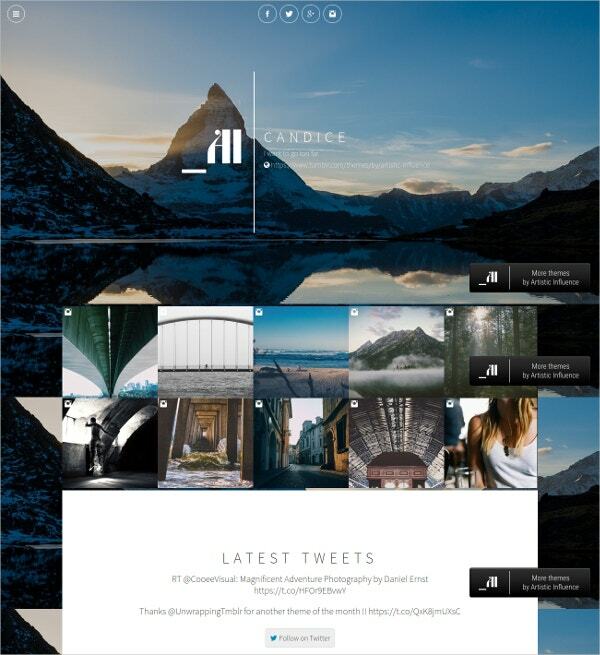 You can also see Tumblr Style WordPress Templates. 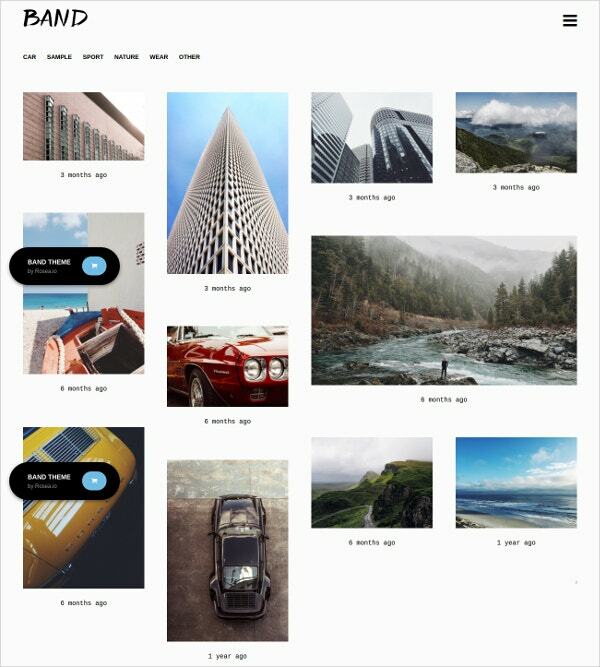 This gallery Tumblr theme is a spectacular premium portfolio that has multiple columns. This theme is best used for the posts of graphic artists, illustrators, photographers and web designers. This dark mode enables them to showcase their creations while giving a personal and intimate touch to their posts because of the color setting. This dark theme is beautifully built and designed for your stunning photos and relevant posts. The continuous scrolling through the content enables readers to follow the intended flow and be captivated by the message and the intention, which is made more appealing through the use of the beautiful dark color theme. This elegant dark theme is best used for blogs that are used for posting of various types of content. This theme supports all post types. Custom colors and images are also available so that you can add your personal touch to the page while staying with the elements of the theme. The theme also enables a high-resolution display of your photos so you can make the most out of your blog. This dark theme uses an intricate and elegant background design. The background resembles renaissance age designs which give an aura of elegance and sophistication to your posts. This theme also enables grid capability, meaning you can rearrange your posts and photos on the page as distinct tiles on the page grid, utilizing more space. This theme is packed with features and is a comprehensive creation. The columns shown adapt to the specific user’s screen resolution and users can choose to display up to 5 columns. The theme also supports High-DPI and Retina displays, meaning 500px images will display on the index. It is also compatible with most mobile devices. 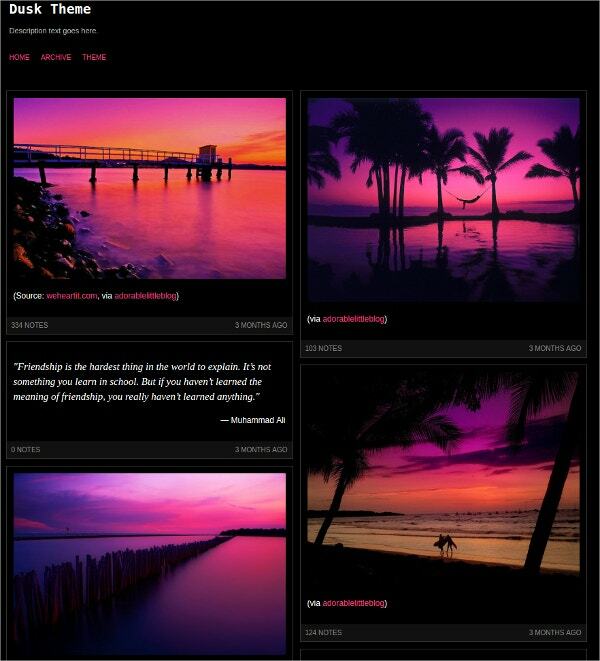 This theme uses two columns to display your posts and photos initially. The grid scheme also makes the display more space efficient and easy on the eyes to read. The theme only come in minimal preset settings, so users have the freedom to tweak the configurations they would want to edit to personalize their page. 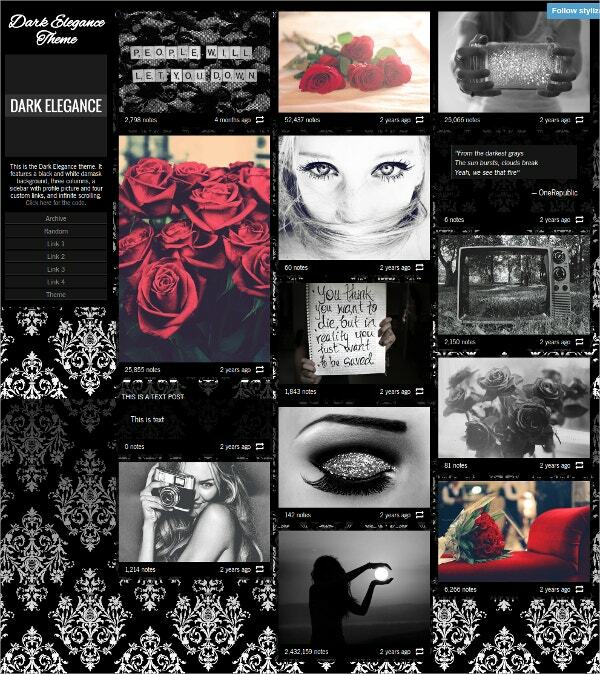 This amazing dark theme is best used for Tumblr pages that use and post mostly photos and pictures. The theme enables them to capitalize and build the page around these important elements. 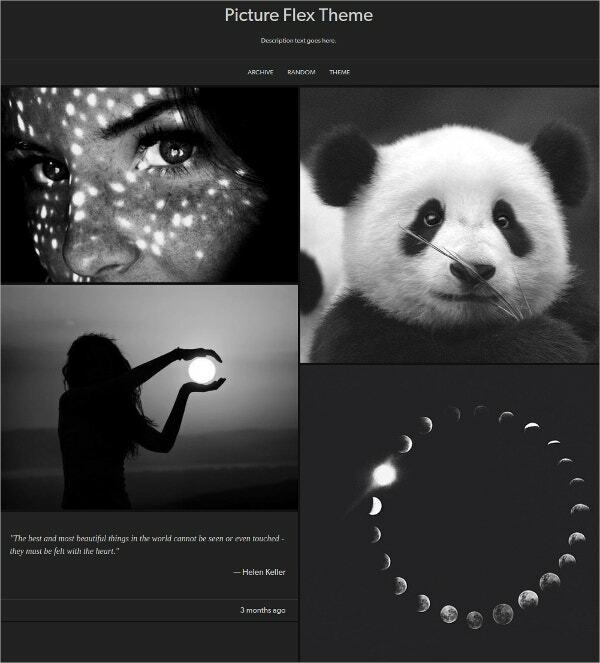 The grid scheme displays two columns simultaneously which display the posts in a wider view than most black and white Tumblr themes. This dark theme uses a distinct single column scheme that freely supports all types of posts, especially high-resolution photos. The theme has a wide range of customization options and color palettes available for the user. The use of this theme also requires little to no skills in coding, so beginners are welcome to use this theme too. 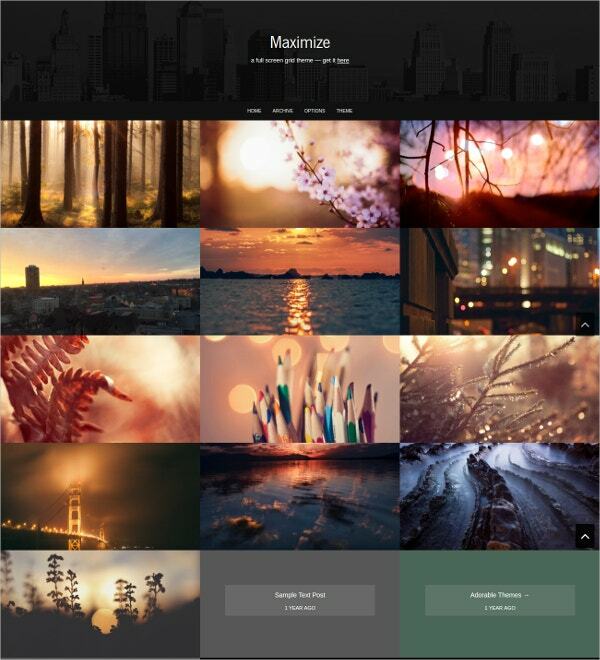 This dark theme sample is a wonderfully designed three column grid scheme to display photos. Infinite scrolling is also available in this theme so visitors are free to view all the posts in only one continuous page. The theme allows the use of up to 12 icons for social media so users are free to share their pages on different platform simultaneously. Up to 5 custom links can be used by the user in the theme. This unique theme uses a single column which goes well with both text and visual posts. The theme displays these posts as beautifully as possible through various customization options. Using this theme doesn’t need a high technical background in coding, which makes it more convenient for most users. This theme supports retina display and looks amazing on both computer and mobile devices. This theme features strong minimalistic elements. It supports display of all types of posts. Users can fully customize their blogging experience by changing key elements in the theme freely such as background color and image, sidebar characteristics, and link hover colors. 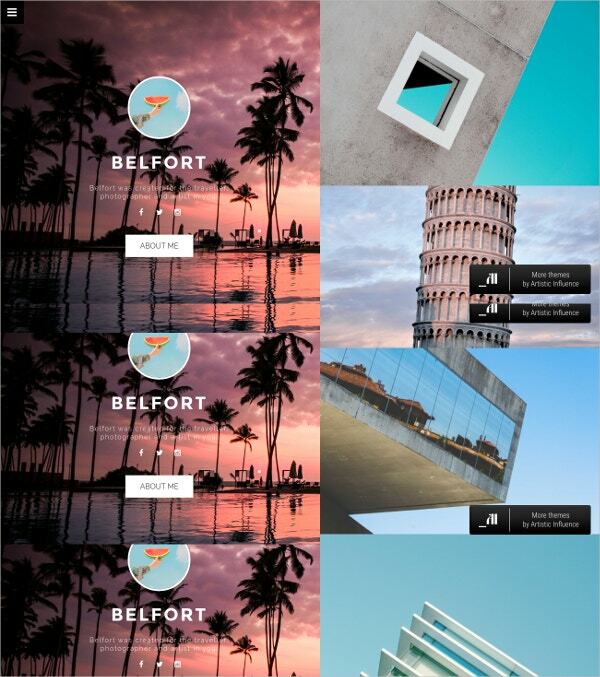 A continuous background image is also available. Users also have the option to display captions and tags. 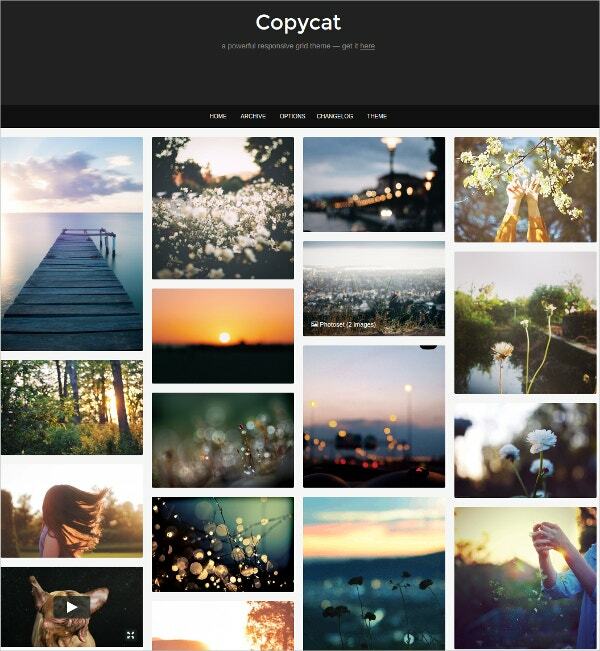 This theme uses a full-screen grid scheme for photo galleries. The display adapts itself to fit the viewing screen of the readers. It also features a lightbox which lets users see full-sized pictures and videos on the same page. Text and audio posts are also supported in the lightbox. The use of Tumblr for personal and business purposes is an ongoing trend and it will expand in the years to come. 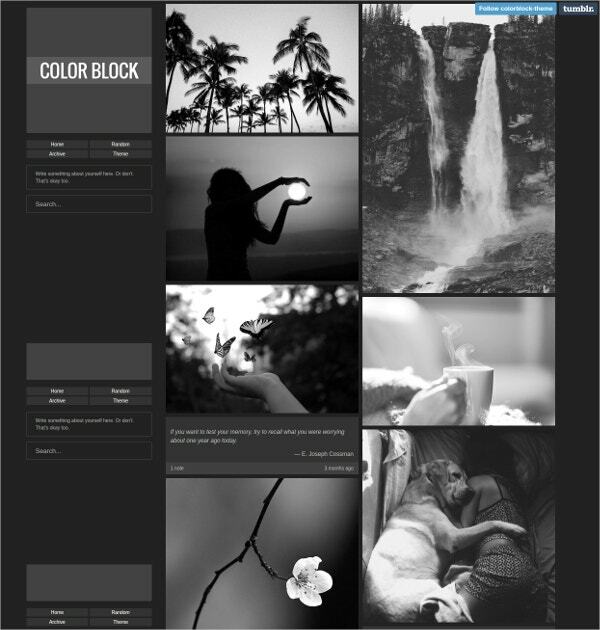 Carefully studying black and white Tumblr themes for your blog will save you time and effort in creating your page. These themes will guide you in making the best page for you and your personality. You can also see Floral Tumblr Templates.